Diwali (often written Deepavali) is a significant festival in Hinduism, Sikhism, Buddhism, and Jainism, and an official holiday in India. Adherents of these religions celebrate Diwali as the Festival of Lights. They light diyasâ€”cotton-like string wicks inserted in small clay pots filled with coconut oilâ€”to signify victory of good over the evil within an individual. Ganesha Chaturthi celebrated all over India, mostly in Maharashtra, Gujarat, TamilNadu, Goa, Andhra Pradesh, Karnataka, Odisha and Chhattisgarh. Outside India, it is celebrated widely in Nepal and by Hindus in the United States, Canada, Mauritius, Singapore, Malaysia, Thailand, Cambodia, Burma, Fiji, Trinidad & Tobago, and Guyana. 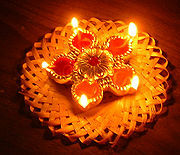 The five day festival of Diwali occurs on the new moon between October 13-November 14. On the Hindu calendar it is centered on the new moon day that ends the month of Asvina and begins the month of Kartika, beginning on the 13th day of the dark half of Asvina (Asvina 28th) and ending on the 2nd day of the bright half of Kartika (Kartika 2nd). The main day of celebration varies regionally. Lord Ganesha, the son of Shiva and Parvati. Parvati asked him to guard at the door while she was in her bath. When Lord Shiva returned and was stopped by this unknown child Ganesha, Shiva in rage cut off the head of that child. As soon as Parvati got to know about the severing of head of her son, she asked Shiva to bring him to life again. Shiva then implanted the head of an elephant on Ganesha's body. This re-birth of Ganesha is celebrated as Ganesh Chaturthi, also known as 'Vinayaka Chaturthi' or 'Vinayaka Chavithi'. Oil lamps on the eve of Diwali.